Attention all Virgo writers, novelists, and poets. They tried to tell you you were tidy. That’s about it. Tidy. They had loads of nice things to say about Aquarius and Gemini, but for you? A naked lady, who’s real clean–Oh, and highly critical, too. What a load of hooey. The real stars that you are interested in, Virgo writer, lie in the pantheon of writers who’ve come before you. And from the looks of things on the maps of my biographies and in the tea leaves at the bottom of my cups, you Virgos are heading into a perfect storm of creativity. I’ll stop the charade here and say WE and not you. We Virgo writers, as you’ll recall from the master list of A Writer’s Astrology, are intellectuals of mystery. But that’s not all we are, of course. This past week and weekend, we were heading through a House of Regionalism and Local Color, our moons rising in whatever PLACE we called home, our stars pining for the constellation Nostalgias. Perhaps you felt it? 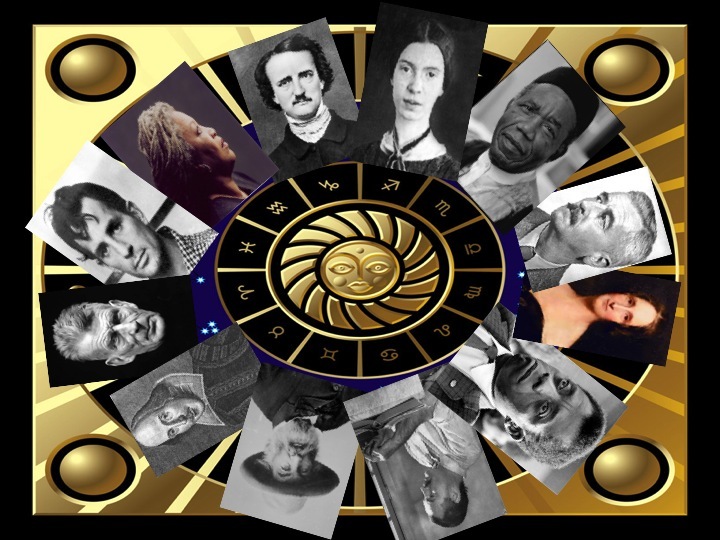 The energies gleamed from past accomplishments into regionalism by Virgo luminaries of the past. All of these writers celebrated the places they called home, feeling areas robustly as though they were persons, for in these Virgo hands, they are. As the leaves change and you are drawn with your keen sensibilities to reflect on the autumns you’ve known, prepare to be invigorated by the passing of the House of Cooper. But be advised, you are heading into a different constellatory paradigm–your strongest, the House of Wells-King. In the coming weeks, you shall pore over the darkest possibilities, extracting from disaster richly told the most passionate delights. Hold on tight. The macabre wings of inspiration you ride accompany a surplus energy. You’ll be prolific as never before peering at your world as through a glass darkly. Also, your lucky colors are umber and mauve; and the numbers 6 – 12 – 33 – 101 are lucky for you all week. Today’s famous Virgo birthday: John Knowles September 16, 1926 author of A Separate Peace. Writer astrology? Very interesting. I’m a Virgo Writer, so of course I loved this. Glad to hear it, my fellow intellectual, shy, kind, diligent and yes, often quite tidy, friend. Thank you. I hope you also checked out the earlier post. Let me know if you approve of my lunar assessments of the Leo writer. I’m sure it comes as no surprise to you, but I was blown away by how many “heavy” writers come out of the LEO alignments. Thank you [gracious bowing] for your feedback! My tidy pleasure, fellow Virgo!